Our visiting speaker was Prof Jim Bennett who came to talk to us about "The beginnings of the Nautical Almanac and Astronomical Ephemeris, 250 years ago". Prof Bennett is a historian by profession and became interested in astronomy whilst studying for a degree in the history of science. He is currently Keeper Emeritus at the Science Museum in London. He began by saying that 2017 marks the 250th anniversary of the "Nautical Almanac" as it was more commonly known in its early years of publication. It was actually published in 1766 by the then Astronomer Royal, Rev Dr Nevil Maskelyne with data for 1767. It allowed sailors at sea to determine their longitude by making careful observations and calculating a "lunar distance", which is the angle between the Moon and another celestial body such as a star or the Sun. They could then use this lunar distance result along with the Almanac to work out what the time would be back in Greenwich, London. Knowing the time in London and their local time (from the height of the Sun at local noon) they could then work out their longitude. Prof Bennett commented that reliable marine chronometers (i.e. small clocks that would work correctly at sea on a rocking ship) that could be used to work out this important time difference between Greenwich and local time only became available in the 18th Century and were very expensive. They would eventually make this lunar distance method redundant but they only became affordable in the 19th Century. The story of the Almanac begins when Maskelyne was appointed in 1760 to observe the 1761 transit of Venus across the disc of the Sun from the island of St Helena. Accompanying him was the mathematician Robert Waddington who was to help him with the calculations of the transit. The reason behind the expedition was that by timing how long it took for Venus to cross the Sun's disc from different latitudes on Earth, astronomers could calculate the Earth-Sun distance. Maskelyne's team would be one of many to observe the transit from various parts of the globe. Sadly, bad weather meant that Maskelyne's party was unable to observe the transit of Venus but the journey allowed him to try out and refine the lunar distance method for finding out longitude at sea. When he got back home from the expedition he set about publishing the method and reference tables in a book entitled "The British Mariner's Guide". 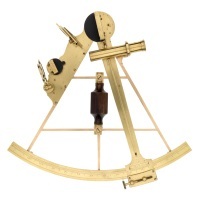 After further voyages to check the method produced accurate results for longitude, he oversaw the annual publication of a book called "The Nautical Almanac and Astronomical Ephemeris", which continued until it was split into different publications to suit either navigation at sea or purely astronomical observations. Today you can purchase almanacs for navigation at sea or in the air as well as an almanac for astronomical purposes.